This page is dedicated to Smartcat’s theme Relia. Relia is a WooCommerce-ready, highly customizable WordPress theme by Smartcat. With a skin color picker, transparency control for overlays, custom post types and unique widgets, Relia can be any style that suit your site’s needs. Read on to find out how to make Relia your own. Click “Choose File” and select the compressed (.zip) Relia file you just downloaded from your computer. Decompress the Relia (.zip) file that has just downloaded to your machine by double-clicking. Copy and paste the Relia file into themes. 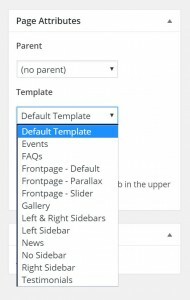 Reload your WordPress dashboard, and click “Themes”. You should now see Relia included. Your licence key is included in the purchase confirmation email you received from Smartcat. After activating Relia on your site, click on Appearance > Relia Licence. Please note – Relia Pro is a single-use licence, meaning it can be active on one domain at a time. It is the user’s responsibility to deactivate the licence before moving it to a new domain. If you plan to move your Relia Pro licence, please not that deleting the WordPress install while your Relia Pro licence is still active will not deactivate your licence. It may result in permanently preventing you from reactivating your licence on a new site. Relia features two large banner areas on the front page: the Header (above the Primary Navigation) and the Jumbotron (below). You can display an image in the Header, or a select a static color. To customize, go to Customize > General > Header. Select the Radio button for either Image or Color, then upload / select your preferences below. Upload and resize a Logo, which will replace the Site Title. The Jumbotron can display up to 5 images in a Slider, or a Single Static Parallax Image. You can set your preferences under Customize > Jumbotron > Jumbotron Settings > Jumbotron Style. You’ll find the site color, font and sidebar settings under Customize > Appearance. Under Skin Color, you have the option to set one of the six included color templates, or set a custom selection using an HTML color picker. 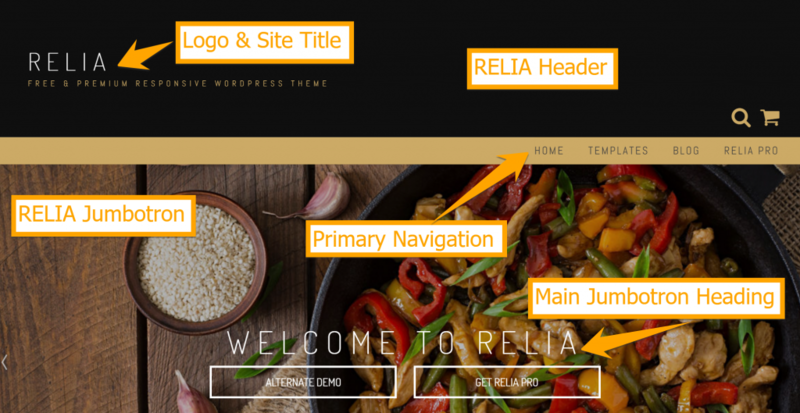 Relia features four full-width homepage Widget Areas (A, B, C & D), which can each be loaded with several widgets. You can set the Widget Area Content from Customize > Widgets. Each Widget Area can host multiple Widgets. Relia Current Events: Create your Events from the WordPress dashboard under Events > Add New. Then, add the Events Widget to the homepage to display them. Relia FAQ: Create your FAQs from the WordPress dashboard under FAQs > Add New. Then, add the FAQs Widget to the homepage to display them. Relia Gallery: Create your Gallery items from the WordPress dashboard under Gallery > Add Gallery Item. Then, add the Gallery Widget to the homepage to display them. Relia News: Create your New item from the WordPress dashboard under News > Add New. Then, add the Testimonials Widget to the homepage to display them. Relia Testimonials Carousel: Create your Testimonials from the WordPress dashboard under Testimonials > Add New. Then, add the Testimonials Widget to the homepage to display them. To replicate our demo, go to Appearance – Customizer – Frontpage – Frontpage Content and select the Static Page option. Relia features the following pre-formatted custom post types to simplify page design. These can be displayed in Widget areas using their Relia Widgets or set as Page Templates to feed into their own featured pages. Relia Pro fully supports the WooCommerce ecommerce WordPress plugin, integrating the product list template (archive) as well as the single product template. You can use Relia Pro to set up your store, the shopping cart, product descriptions, reviews, etc. You can install the WooCommerce plugin directly from your WordPress dashboard. Go to Plugins > Add New and then search for WooCommerce in the WordPress directory. Install and activate as per standard WordPress procedure. Once you activate the WooCommerce plugin, the shopping cart and product sections will automatically appear in your WordPress dashboard. Relia Pro also features a sidebar specifically for WooCommerce pages, which will also appear under “Widgets” once the plugin is active. You can put any widget into this sidebar – whether it’s a WordPress widget, a theme widget, or WooCommerce-related Cart / Contents /Products / Featured Items. This sidebar will only appear on the Shop and Single Product Pages. For more help on and FAQs on the WooCommerce plugin, visit their Support page. Check out the Relia documentation, the Relia demo site, or contact us through our Support page.